Heat does interesting things to food. The hotter, the more interesting. That isn’t always a good thing, seeing smoke roiling off of your focaccia can ruin your day. But very often people shy away from using high heat, when really they should give it a chance. So often people will steam or (gasp) boil vegetables, when really, roasting makes them so much yummier. There is a time and place for steaming and boiling, typically when you are going for soft and delicate textures. But if you want to boost flavor, you need more heat, and dryer heat. So why intense, dry heat? Caramelization and flavor concentration. Caramelization is a process whereby sugars and starch in food (yes, chard has sugars in it) is broken down by heat into hundreds of different kind of fragments. Those fragments all have different flavors, flavors which we think of as “yummy” and also that add complexity and depth to the flavor profile. Dry heat also promotes concentration of flavors. Concentration of flavors simply happens when you reduce the amount of water in something. Have you heard of “reducing” a sauce? That is simply boiling away some of the water, leaving behind flavor. 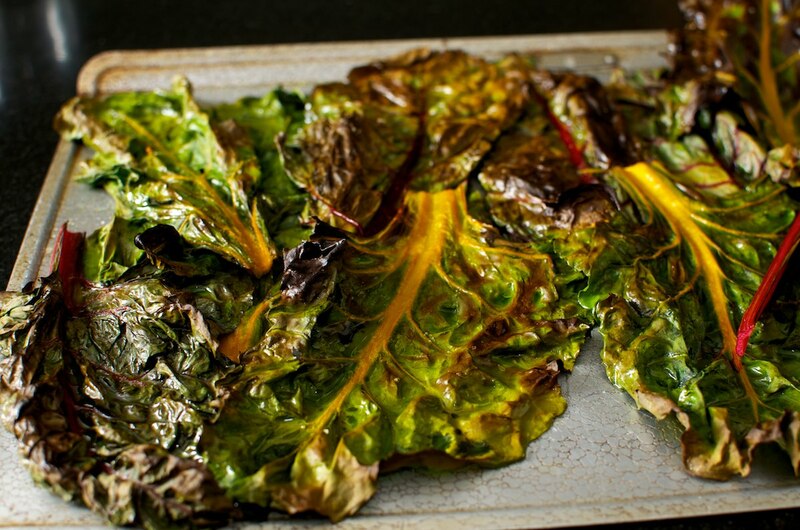 So roasting our chard in dry heat drives off moisture, and intensifying flavors. Boiling on the other hand doesn’t get hot enough for caramelization, and actually adds moisture, diluting flavor. CHARD. OLIVE OIL. SALT. NOW ADD HEAT. LOTS OF IT. 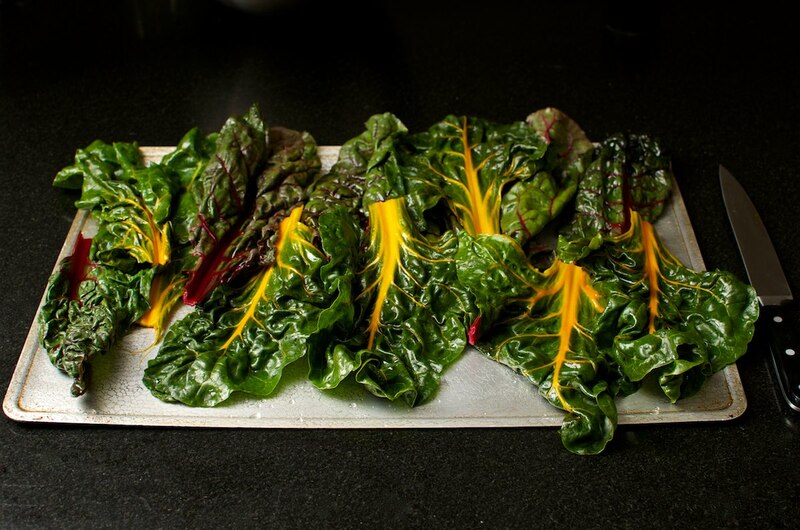 Get a couple of heads of chard. 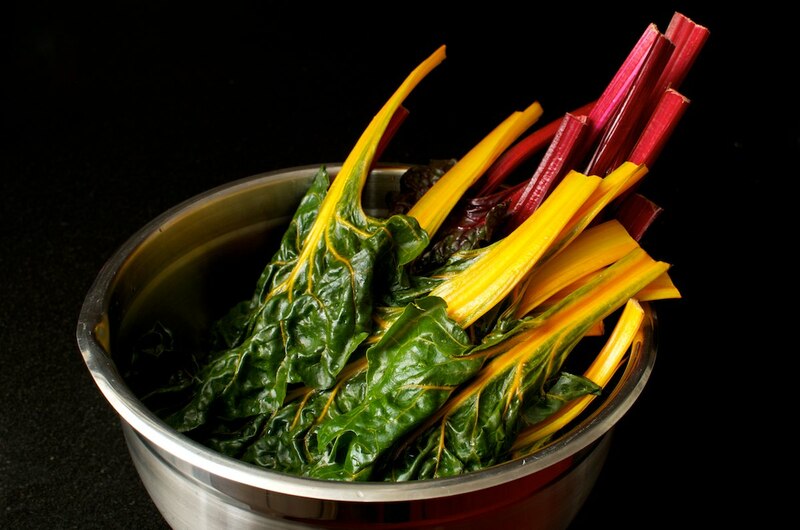 It is pretty if you mix red, gold, or swiss (white) chard. Wash. Trim the stalks if they are tough. If not, leave them, they taste great. Shake them off. You want them somewhere between wet and dry. Wet-ish. In a large bowl drizzle a few tablespoons of oil over the leaves, salt to taste, and toss. Lay them in a single layer on a couple of cookie sheets, and put them in a 450º oven. After 4 minutes swap the bottom and top sheets so they cook evenly. When brown spots begin to form, and a few little patches of the leaves are turning dry, take them out. Serve. Bonus ideas once the chard is out of the oven: Use a little less salt before roasting then drizzle with soy sauce and/or squirt on a little lime juice and/or toss the leaves with some butter and/or sprinkle with nature’s MSG (nutritional yeast). This was written by cedar. Posted on Sunday, February 27, 2011, at 8:56 pm. Filed under Recipes. Tagged easy, vegetables. Bookmark the permalink. Follow comments here with the RSS feed. Post a comment or leave a trackback. It’s like delicious potato chips which are actually good for you. It’s funny, I can actually “hear” you saying everything that is written. I love it! Next up, cookbook!!!!!! Wonderful pictures. I love chard and plan on roasting it which I never have done.